this is the place i play football every tuesday and saturday with my friends, it's my elementary schools gym ... the gym always remembers me on my childhood and days and hours i spent here ... and now i'm back every autumn and winter as father of tho beautiful kids and great wife ... isn't life strange ? Loved the floor here. Congratulations on your 6th place! Excellent shot, congrats on the 6th place! Should have ribboned I certainly had no problem giving this a 10. Awesome shot and processing. great job!!!!!! Nice low perspective, just bring ball closer and crop out some of bottom. Interesting light. One of my favorites of the challenge. Great job at setting a mood with this image. Beautiful! I love the lighting and the tonal range on this, and I'm so glad you didn't center the ball. I like the image, but something about that big ball really annoys me. It is like the photo is out of proportion, or something. Great reflections on the floor. Like the uncluttered look with just the lonely ball for the subject. While it seems a little too dark, I really like the composition and the moodiness (which is probably a result of it being dark, so don't mind me). I like it. Love the lighting and the rich hues. This is a subtle shot that doesn't hit with a "WOW" in the typical 2-second-view-per-vote but has much to offer those who take longer and SEE. EXCELLENT!!!! the lighting is super!!! one of my favorites and only 10s in the challenge! Nice. I really like this. It would be more "DPC" with the ball right in the foreground, but putting it further back in the composition adds a real sense of loneliness to this. Nice. That soccer ball was throwing me off for a minute. Thought it was some HUGE medicine ball or something near the far wall! :D It may be old but seems well kept. Nice POV for this photo. Good luck in the challenge. I would have moved closer to the ball so you can see more colour contrasts. 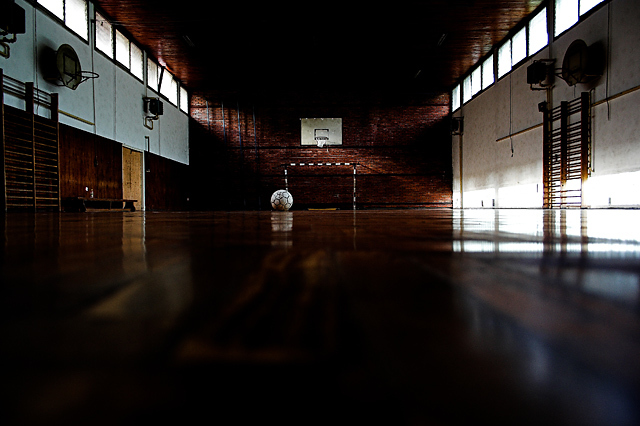 Interesting old gym...love the wooden floors. I would have liked the soccer ball closer up. Proudly hosted by Sargasso Networks. Current Server Time: 04/22/2019 07:57:44 PM EDT.